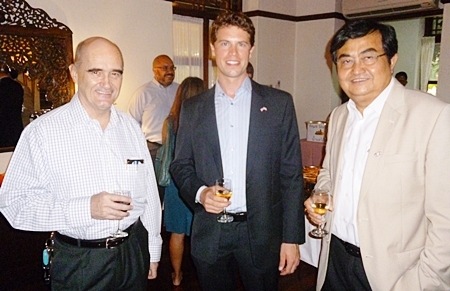 U.S. Consul General Kenneth Foster chats with members of the Expats Club at their meeting held on Saturday, May 26, 2012. The new U.S. Consul General Kenneth L. Foster was welcomed to the Chiang Mai Expats Club on Saturday, May 26, 2012 at their monthly meeting at the Shangri La Hotel. Personable and engaging, he spoke a bit about his background in the State Department where he worked in Cambodia and Haiti. He noted that his appointment is only temporary as previous Consul General Susan Stevenson returned to the United States early due to a family emergency. He added that the assignments are made very early on, so the new Consul General had already been named when he was asked to step in as interim. 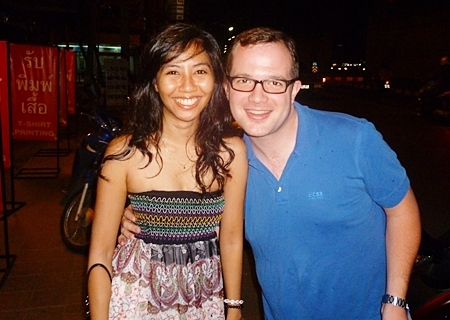 Noting that previous Consul General’s had spoken to the Expats he covered the main functions of the Consulate for Americans; Citizens services which includes reports of births, new passports, B1/B2 Visas for tourists to the United States (immigrant visas are processed in Bangkok), notary, in cases of emergency, arrests etc. Additionally, they work with the Thai government regarding trafficking, both drugs and human. Finally, the monitor and report back on political changes both in Thailand and in Myanmar. 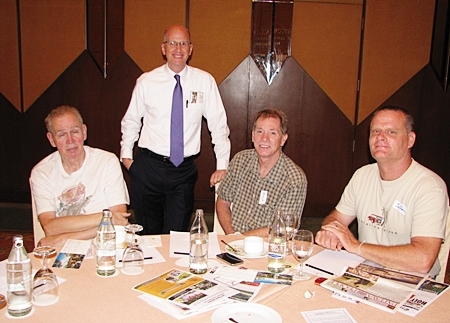 Alan Hall of the Chiang Mai Expats Club meets with some of the members at the meeting held at the Shangri La Hotel. Ken noted that there is also an installation on Doi Suthep run by the U.S in conjunction with the Royal Thai Navy called Detachment 145 which monitors seismic and nuclear activity in South East Asia. Following his presentation, members took to the floor with questions regarding issues important to Americans with the enforcement of the bank account reporting law by the IRS. Americans are required to report bank accounts if their total exceeds $10,000, however, as members pointed out, finding out how to do this is not the easiest task. Banks are also required to report their American account holders to the IRS and this may prove problematic as smaller banks refuse to deal with the paperwork and may request their American account holders to close their accounts. Bangkok Bank and other large banks do report their American account holders so those opening a new account may wish to choose a large bank, Ken noted. The American Fourth of July party is not organized by the Consulate he noted, adding that local organizations usually coordinate and organize the party but he has not yet heard of one for this year. The meeting closed with the usual lucky draws as many headed out hoping the skies would clear. prepare for the start of the meeting. Northgate regulars perform on their 5th anniversary. The North Gate Jazz Co-Op saw a more than full house for its 5th anniversary party on Saturday, May 26, 2012 with the small venue packed to the gills to listen to different bands play throughout the night, even spilling into the street and onto the moat as passersby were pulled in by the music. Co-owner Pharadon 'Por' Phonamnuai was there, meeting guests and letting people know about his new book in Thai about his travels as a jazz musician. This well-traveled musician, who has plied his sax from Mongolia to New York and many places in between, laughed and said it would be great to have it translated into English as well, but first things first. Many musicians vied to make sure they could perform on this important night for North Gate, a venue known for nurturing local musicians and allowing them the space to grow in confidence. 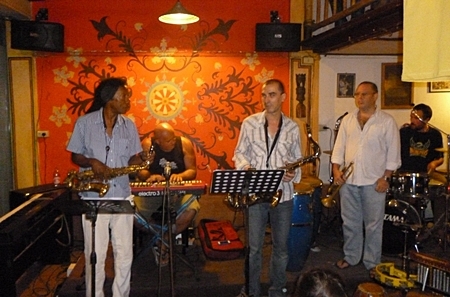 Northgate is open every night from 9.30 p.m. to midnight and has live music every night, Tuesday night is jam night. Northgate can be found on Facebook. 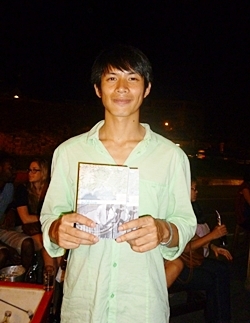 Pharadon 'Por' Phonamnuai shows off his new book. Namwan and Anselm dropped in to enjoy the music. play at Northgate Saturday night. The May meeting of the international travel and tourism professional association Skäl met at the Siripanna Resort on Friday, May 25, 2012. 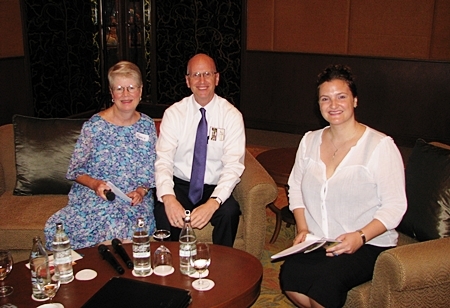 President of Skäl for Chiang Mai and the North Annette Kunigagon announced that the next meeting will be held in Chiang Rai on June 16, directly following the Mekong Tourism Forum which takes place June 12-15. Jaffee Yee pointed out that those wishing to attend the forum and the Skäl meeting could also attend the latest exhibition opening at his gallery there. 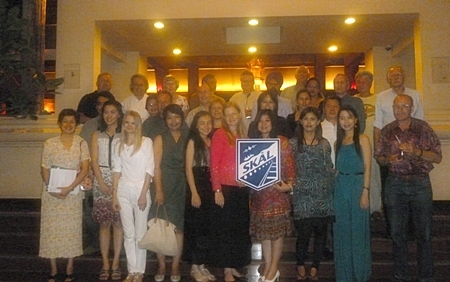 Skål International has approximately 23,000 members in 500 Clubs throughout 87 nations with more opening up, the first club in China held its first meeting on the same evening, and more are opening in Burma and Bhutan. Vanita and Frank Sethi of Fashion King chat with Micaela Hobbs of Crouching Tiger Cycling Tours about the most popular routes the tour takes. New members to the club were introduced as were first time guests including Micaela Hobbs of Crouching Tiger Cycling Tours, Chiang Mai’s only road cycling tour company, many of whose customers are serious cyclists that enjoy the challenge of the Samoeng loop, cycling to Mae Hong Son and Chiang Rai. Frank and Vanita Sethi of Fashion King were back in Chiang Mai after a long absence in Bangkok and were warmly greeted by many members. 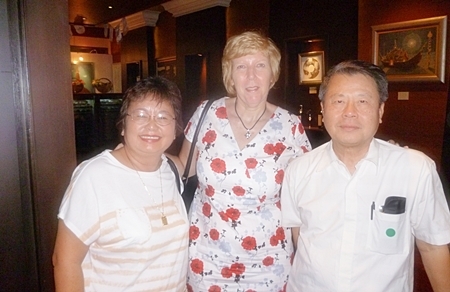 Annette talked about her recent visit to Penang, Malaysia for the Asia Skäl Congress, noting that Thailand’s father of Skal was posthumously awarded “Personality of the Year”, a great reward for a man who had given so much to Skäl Thailand. The evening ended with Siripanna Resort’s fantastic buffet dinner and barbecue featuring steak, seafood and pork as well as a delicious dessert spread before everyone headed home in the rainy evening. Tim McGuire of Segway Gibbon is happily surrounded by the ladies at the pre-dinner cocktail party. 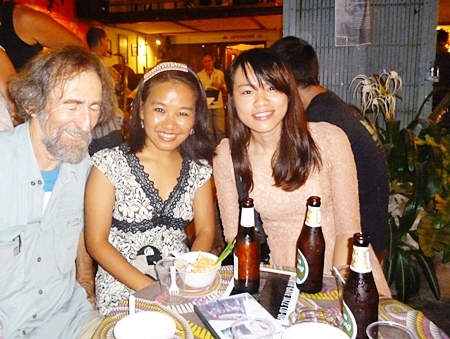 Jaffee Yee chats about the next Skal meeting in Chiang Rai. 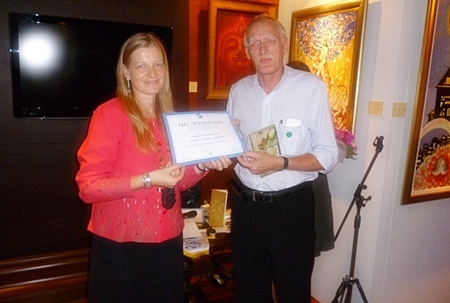 Philip Van Driesten is awarded a certificate as a new Skäl member by President Annette Kunigagon. 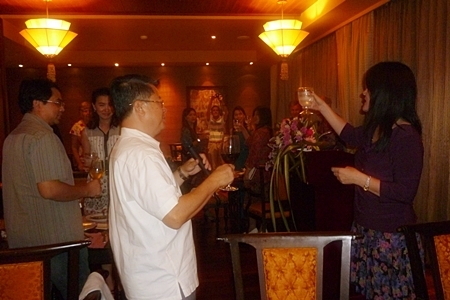 Jaffee Yee and Shana Kongmun of the Chiang Mai Mail lead the crowd in the traditional Skäl toast. The bowlers gathered with the Deputy Governor for a group photo before the event started. The We Love Thailand Club held a fundraising bowling event at Lanna Bowl on Sunday, May 20, 2012 for the December 1 International We Love the King Day. The inaugural event was held with a parade from Tha Pae Gate to JJ Market followed by music and dance performances by Thai, hilltribe and foreign residents. The parade saw several thousand people join in of all nationalities to show their love and respect for HM King Bhumibol Adulyadej. 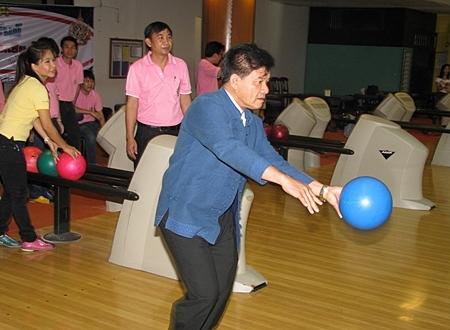 The group organized the fundraising activitiy in conjunction with Chiang Mai Friends Group and the Lanna Bowling Club and saw Chiang Mai Deputy Governor Adisorn Kummurdsiri take to the lanes quite successfully. Parties interested in taking part in this year’s International We Love the King Day can contact Boong Chaladlam at [email protected] or Sudchai Kanulsoonthorn at [email protected]. 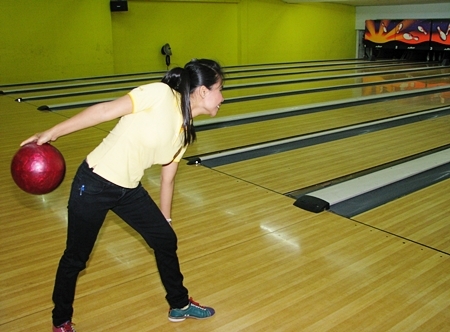 Chiang Mai Deputy Governor Adisorn Kummurdsiri showed off his bowling form at Lanna Bowl on Sunday, May 20, 2012. 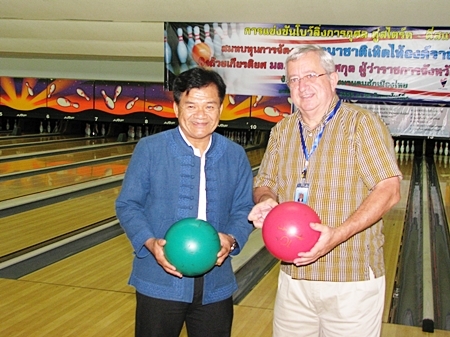 Chiang Mai Friends member Bob joins the Deputy Governor before the bowling begins. Chiang Mai Friends President Duenpen “Boong” Chaladlam takes aim. 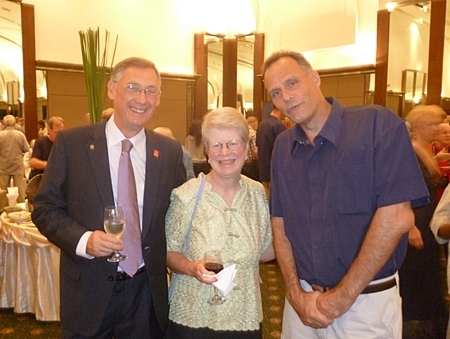 (from left) U.S. Consul General Kenneth Foster, Executive Director of the American Chamber of Commerce Judy Benn and U.S. 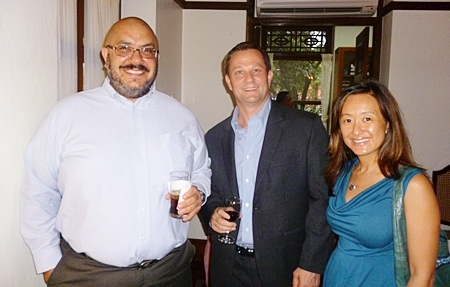 Counselor for Economic Affairs Julie Chung at the AmCham meeting on Monday night. Executive Director of the American Chamber of Commerce in Thailand Judy Benn traveled up to Chiang Mai on Monday, May 21, 2012 to meet with interested business parties at the U.S. Consul General’s lovely old home on the grounds of the U.S. Consulate. The event was attended by both American, Thai and other nationalities interested in working with the American Chamber to start a branch in the North. Ms. Benn noted that 8 companies are required to agree to form the branch before it can be submitted to the committee in Bangkok for approval. 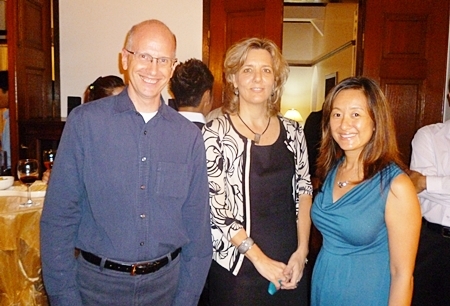 The U.S. Embassy’s Counselor for Economic Affairs Julie Chung joined the event alongside U.S. Consul General Kenneth Foster. Ms. Benn noted that a business does not have to be American owned or the person even an American to join the Chamber, adding that of the 2,000 members only 22% are American and 50% are Thai, but, she added, most of these businesses have some relation to the United States, either as an importer or exporter or providing services to American companies. She added that the Chamber felt it important to move forward on a Northern Thailand chapter given the growing number of companies with ties to the United States. AegisTek is one of those companies making server racks that are sold to corporations and governments around the world. Group Managing Director Monchai Jitkul noted that they just completed telecom waterproof outdoor storage boxes for the London Olympics. Ms. Benn said that the Chamber hopes to not only provide bi monthly meetings but offer services and live streaming of talks held elsewhere. 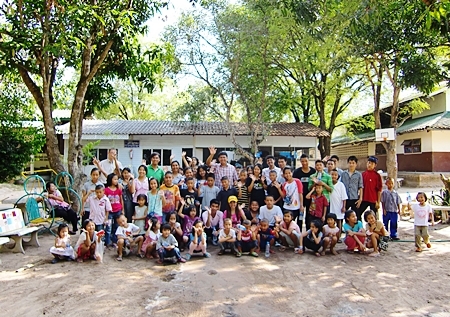 The American Chamber also provides grant aid to schools through their Adopt a School program and while they already provide aid to many in Northern Thailand are always open to more suggestions. Through corporate donations they have provided scholarships through a teacher fellowship program, paying the salaries of 13 teachers at needy schools. 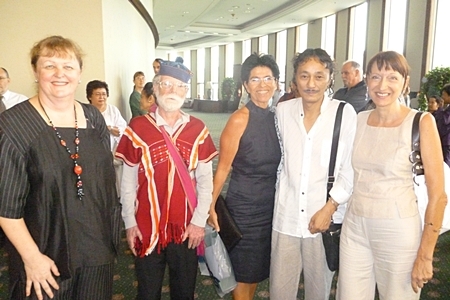 Local business owners with ties to the United States attended the meeting. Outgoing Regional Security Officer: Corey Ford chats with Julie Chung and Jim Boyle of AegisTek. Colin Jarvis joins Political/Economic/Public Diplomacy Officer: Paul Neville and Monchai Jitkul of AegisTek over a drink at the meeting. Swiss Ambassador Christine Schraner Burgener presents HM the King’s endorsement of Marc Dumur as the new Honorary Consul for Switzerland in the North. Marc Dumur, well known among Chiang Mai residents received approval from His Majesty the King to become the newest member of Chiang Mai’s diplomatic corps at a reception held at the Imperial Mae Ping on May 10, 2012. 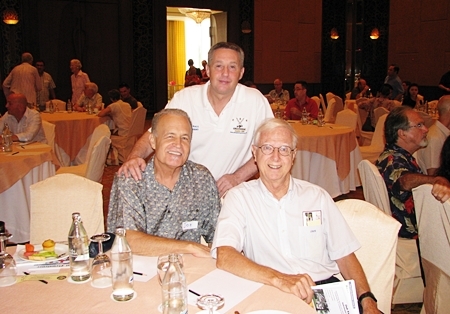 Marc Dumur has been resident in Chiang Mai and the North since 1988 and has been a very active member of the hospitality organization Skäl, including being chosen as President of the organization. 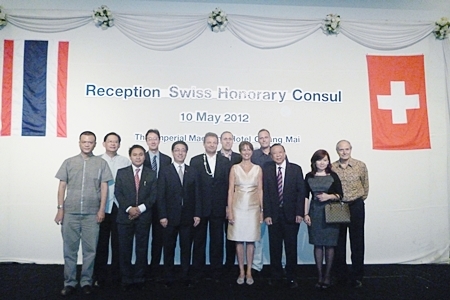 Marc was welcomed as the new Swiss Honorary Consul by the Ambassador of Switzerland, H.E. Christine Schraner Burgener, who presented Marc with both his accreditation from the Swiss Government and from HM the King as signed by Prime Minister Yingluck Shinawatra. 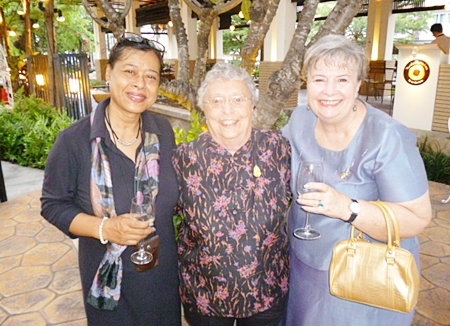 She welcomed the visiting crowd of Swiss residents, friends, well wishers and members of the Chiang Mai diplomatic corps to the evening, speaking in turn in German, French, Italian and English, as the three main languages of Switzerland are French, German and Italian, along with a fourth official language; Romansh. However, she noted that perhaps it was easier to speak in English so that all visitors could understand. She added that even though the area of responsibility is quite large, and the Swiss population in the North a fairly significant number, she was sure that the well behaved reputation of the Swiss would keep Marc’s job easy. The Swiss Honorary Consulate will serve the Provinces of the North including Chiang Mai, Chiang Rai, Mae Hong Son, Phrae, Phayao, Lamphun, Lampang, and Uttaradit. 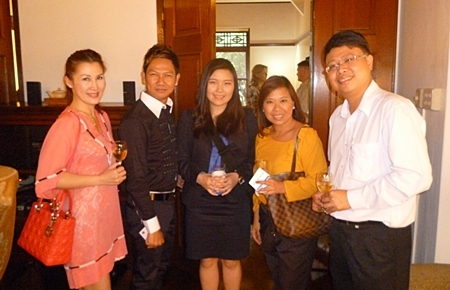 The Consulate is located in the Frangipani Serviced Apartments on the ground floor, at 11/1 Soi 13 Prapokklao Road. The Consulate will not be able to issue visas but can help with many documentary issues and can aid Swiss citizens in need. 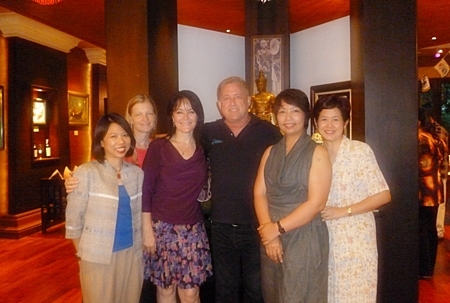 Members of the Chiang Mai diplomatic corps welcome Marc Dumur on stage at the Imperial Mae Ping Hotel on Thursday, May 10, 2012. 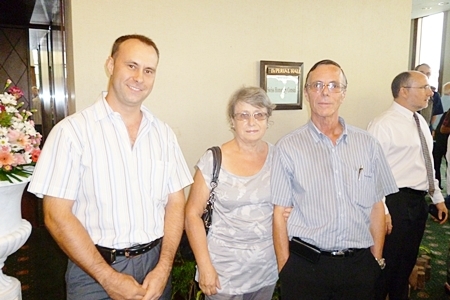 Swiss residents from Chiang Mai came to the ceremony to meet their new Consul. Friends, well wishers and many Swiss residents were on hand to greet Marc Dumur in his new role as Honorary Consul. 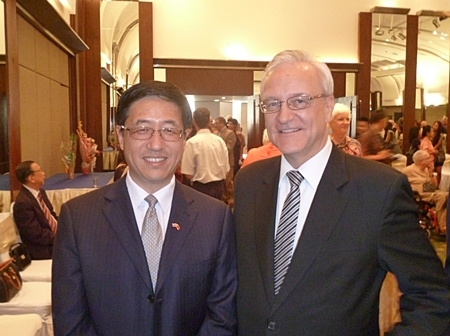 Chinese Consul General Dr. Zhu Wei Min chatted with Imperial Mae Ping’s General Manager Peter Schnyder at the reception. 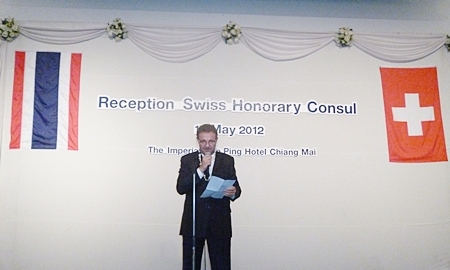 New Swiss Honorary Consul Marc Dumur addressed the crowd and discussed his upcoming role and responsibilities. 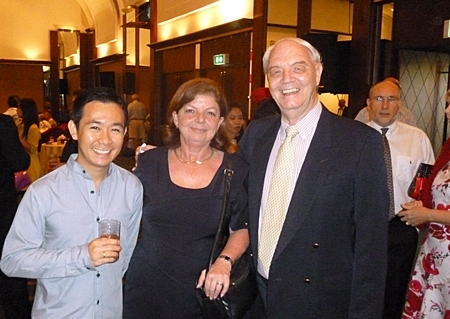 Dutch Honorary Consul Peter van Loo (right) joins Americans Roger and Nancy Lindley at the party as residents of all nationalities turned out to meet the new Honorary Consul. The party saw friends and many prominent local residents turn out to greet Marc Dumur. 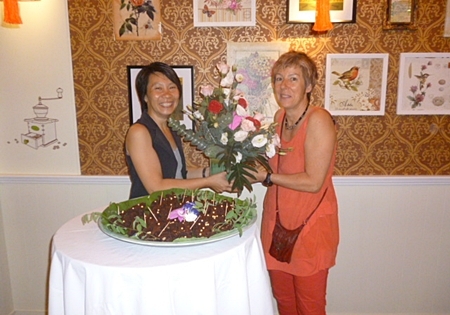 Sabine Zimpfler is a fan of K. Jim’s as she presents a welcoming gift in front of a platter of delicious brownies. The newest venture of K. Jim of La Gondola opened to great fanfare and only a bit of rain on Saturday, May 5, 2012 at Nimmanhaemin Soi 6. 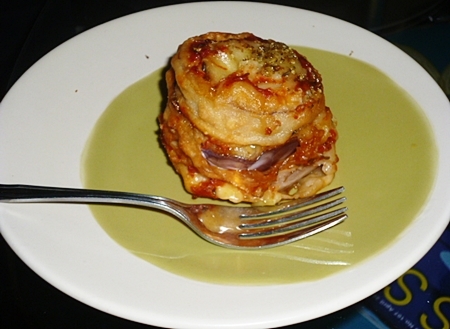 Also known for the wonderful Girasole, now the Nimman area of town will benefit from their culinary expertise. The new restaurant is small but charmingly decorated and has a large shared outdoor space in front, located inside Punna Place next to the Powerhouse Gym. The opening of Pasta Paradise was well attended by many friends and fans of their food and the selection at opening did not disappoint. The new restaurant has the largest selection of pastas in town and will be open daily except Wednesdays from 10 a.m. to 10 p.m. 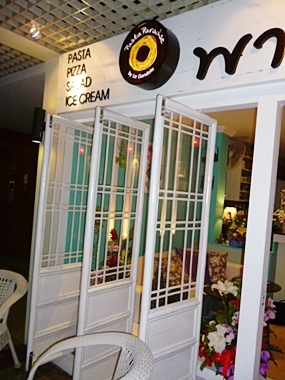 The new restaurant at Punna Place is cute and small but with a great menu. 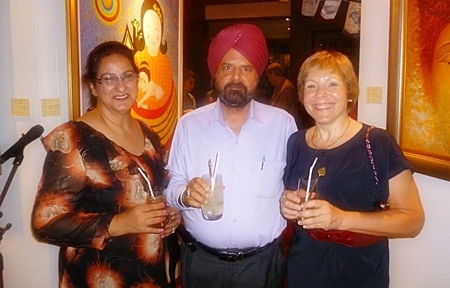 Zonta ladies Asiyah of Natiryas Galleria, Joyce Morgan and Margaret Bhadungzong enjoy the opening of the new restaurant. Some of the many delicious canapés that guests enjoyed at the grand opening on May 5, 2012. Governor M.L. 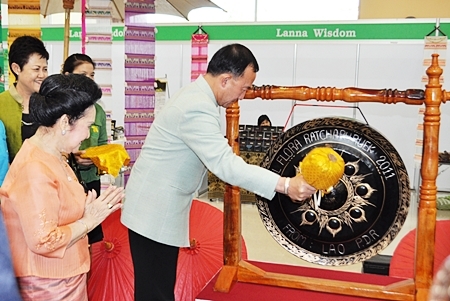 Panadda Diskul hits the ceremonial gong to open the show while President of the Chiang Mai Culture Council Dr. Chao Duangduan na Chiangmai looks on. 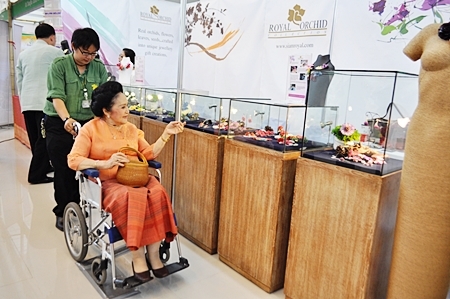 The Royal Park Rajapruek is hosting a large OTOP Fair this weekend featuring the “Wisdom of Lanna” with products made by elderly people in Chiang Mai. The event is designed to promote the wisdom and knowledge of the elderly. 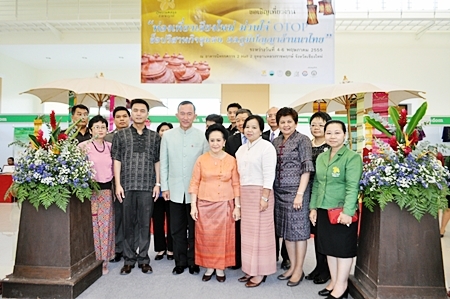 Chiang Mai Governor ML Panadda Diskul was joined by President of the Chiang Mai Culture Council Dr. Chao Duangduan na Chiangmai at the opening of the event on May 3, 2012. 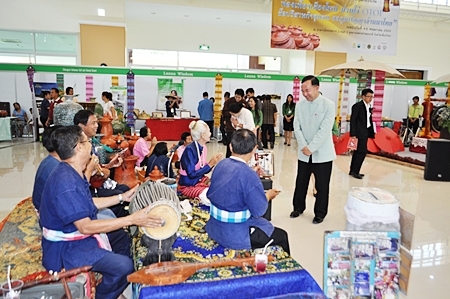 The Royal Park Rajapruek is working with the Chiang Mai Tourism Business Association, the Commercial Development Office and the Research and Development Branch of the Park to host the event that has booths featuring everything from handwoven textiles to herbal remedies. The fair is being held from May 4-6 from 10 a.m. to 6 p.m. at the Exhibition Building 2 at the Royal Park Rajapruek. (Photos courtesy of Royal Park Rajapruek). Governor M.L. Panadda Diskul and Dr. Chao Duangduan na Chiangmai are joined by Royal Park Rajapruek officials and members of the Tourism Business Association at the opening. Dr. Chao Duangduan na Chiangmai browses among the many beautiful items for sale. The Governor enjoys live music performed by local people at the fair. The kids waved goodbye to everyone as their very fun day came to a close. (Photo courtesy of Franck Morand). The Classic Cars of Lanna Club held a special Kids Day Out on their last meeting, taking kids from the Garden Eden and Rena Green Memorial Children Homes to the very fun Horizon Village and Resort on Sunday, April 30, 2012. 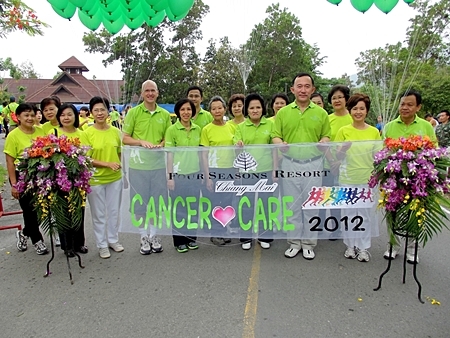 The event was sponsored by Quantel Medical and Horizon Village and Resort. The kids enjoyed their ride in the many classic cars that participated and member Franck Morand’s generous help and organization ensured the day’s success. The kids had lunch at the Resort, enjoyed the lovely gardens and generally just had a lot of fun. 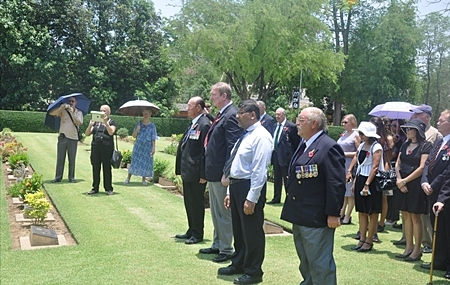 The Wreath Layers at Chungkai, nearest Maurice Hewson, British Ambassador Asif Ahmad, Tony Archer, and Fred Beavis. As always in April members of the royal British Legion headed for Kanchanaburi and the River Kwai for the ANZAC Day Memorial Service. This year however was a little bit special in that 70 years ago this year work started on the infamous Thai/Burma Railway, also this year was to be the first get together of the Royal British Legion Thailand. Members from all over Thailand including Pattaya, Bangkok, Korat, Chiang Mai and Udon Thai made their way to Kanchanaburi on 24 April to get ready for the service on 25 April, many attended the dawn service followed by the main one at 10 a.m. After that and the cold beer had finished our group headed to the lesser known war cemetery at Chungkai to hold our own small service and lay four wreaths (the only ones laid at Chungkai). The Ambassador chats with Albert Trayling, our oldest member on parade. 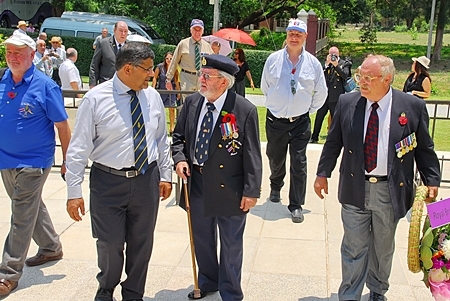 British Ambassador Asif Ahmad was in attendance at the main service and on hearing of our visit to Chungkai asked if he could join us, this was another occasion where the Ambassador has shown both his support and respect for the work of the Royal British Legion in Thailand. Our Ceremonial Duties done we split into smaller groups and visited the many attractions around town, many returned to the hotel to get out of the intense heat to have a few cold ones! We added an extra day on the itinerary this year, on the morning of the 26th there were trips to the Bridge and Hellfire Pass followed by the social highlight of the trip our BBQ at the Thai Garden Inn resort, many thanks to Judy and John for hosting us, Grieg Ritchie, Clair Ritchie, Dot Knowles and Tam Holmes for doing all the preparation and cooking and to our new sponsors of the event Acorn Distribution formally MatVic Butchers. 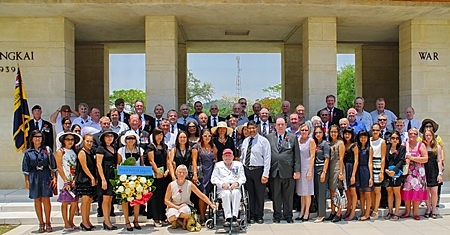 The group at Chungkai war Cemetery, the Ambassador and Bert Elson centre. The BBQ was once again a great success allowing all our members to meet and greet, we also presented two five year Poppy Appeal Certificates of Thanks to members Bob Myers and Fred Beavis, a special thank you was also said to our Welfare Team. Whilst we were all getting ready to travel to the service four members were already in the area and walked, cycled and kayaked the length of the railway from Three Pagodas Pass to the River Kwai in aid of the Royal British Legion and the Australian Returned Services League, they arrived just before the service and they more than anyone deserved a cold beer along with a lot of thanks!s! 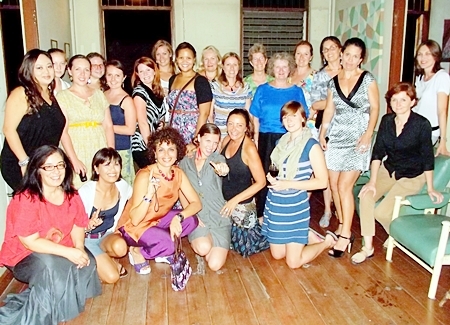 The Chiang Mai Royal British Legion meets every Wednesday at the Olde Bell on Loi Kroh Road at 7 p.m. 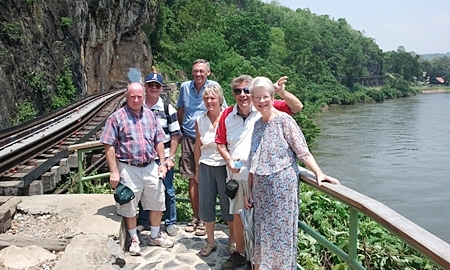 Some Chiang Mai members on the railway.